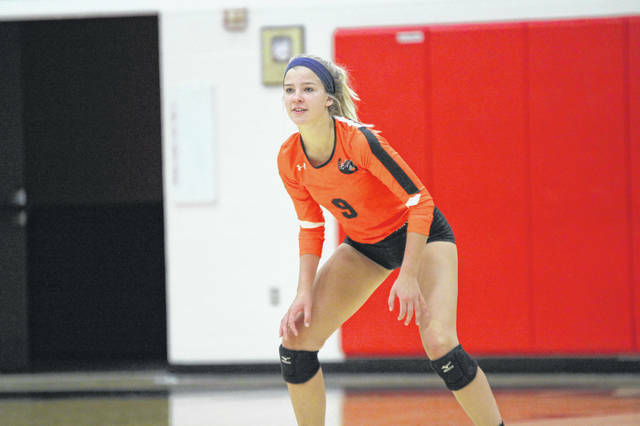 Delaware Hayes senior Emily Gray is a defensive specialist on the volleyball team. Entering the 2018 season, Gray is in the running to take over as libero after playing behind Audrey Hannahs the past three seasons. Delaware Hayes senior Emily Gray has many talents. But – unequivocally – her biggest talent is juggling. She played volleyball and ran cross country in the fall, played club volleyball and ran indoor track in the winter, and ran track in the spring all well working a couple of part-time jobs and maintaining a grade-point average high enough to make the honor roll as a student. Out of all it – Gray said working her jobs are the most difficult thing. She works at a pretzel shop in Polaris Mall and spends the summer lifeguarding at the Delaware YMCA. During the school year, she’s typically out the door for school in the morning, participating in sports in the afternoons and early evenings, and working the closing shift at her job. “I think the family structure for (her) is so important for the types of qualities that have been ingrained in (her) in the home have been a huge part of their work ethic, and (her) success and just the attitude that (she has),” new Hayes volleyball coach Raynard Martin said. Gray said she used to spend money irresponsibly, so her parents made her pay for her car and all the expenses that go with that. They wanted her to be prepared for the responsibility of life after high school. She could easily give up sports to focus on school and work. “But, I can’t because I love it, and I can’t just give it up,” she said. Gray has always been a good teammate, and now she’s blossomed into a leader. Coaches are only allowed so many days to work with athletes, so Martin has seen Gray step up and take on a leadership role in open gyms this summer. Gray is a defensive specialist on the volleyball team and runs the 800-, 4×400- and 4×800-meter relays in track. She’s in the running at libero this upcoming season in volleyball after playing behind Audrey Hannahs the past three seasons. She’s facing competition at the position from junior Mia Thompson. But, Gray thinks that competition is not only better for both players, but the team as well. That’s important to Gray. She wants to be reliable to her teammates no matter the role she plays. Gray hasn’t decided if she’s going to play at the collegiate level. She wants to major in exercise science. She wants to work in physical therapy when she graduates. “I feel like I’ll miss it if I don’t play,” she said.